It’s said that home ownership is the “American Dream,” and that may be true for many, but for others seeking more options in life, a vacation house for free can add a lot of fun and additional income stream to the American Dream. If you love to spend time in a place near and dear to you a vacation home for free may be feel like your living a dream. Yet like most worthy endeavors, failing to prepare for the mission it will sadly result in a “Pipe Dream,” a nightmare or a disappointment! With the bounty of reality renovation and real estate “flipping” shows on TV these days a new focus has been put on vacation rentals, you may have seen shows like “Vacation House For Free,” “Buying the Beach,” or “Beach Front Bargain Hunt.” These shows can stimulate a lot of excitement with the idea that if buyers are willing to rent out their vacation home during the peak season, they may earn enough income to live in the home for free during the rest of the year or during visits, makes sense right? We will discuss a 6 step process that will help you get started on the right track with your vacation house for free and some things to consider to keep you safe in the process. The dream of owning a vacation home for free is absolutely possible, however, only few really keep their revenues greater than expenses. 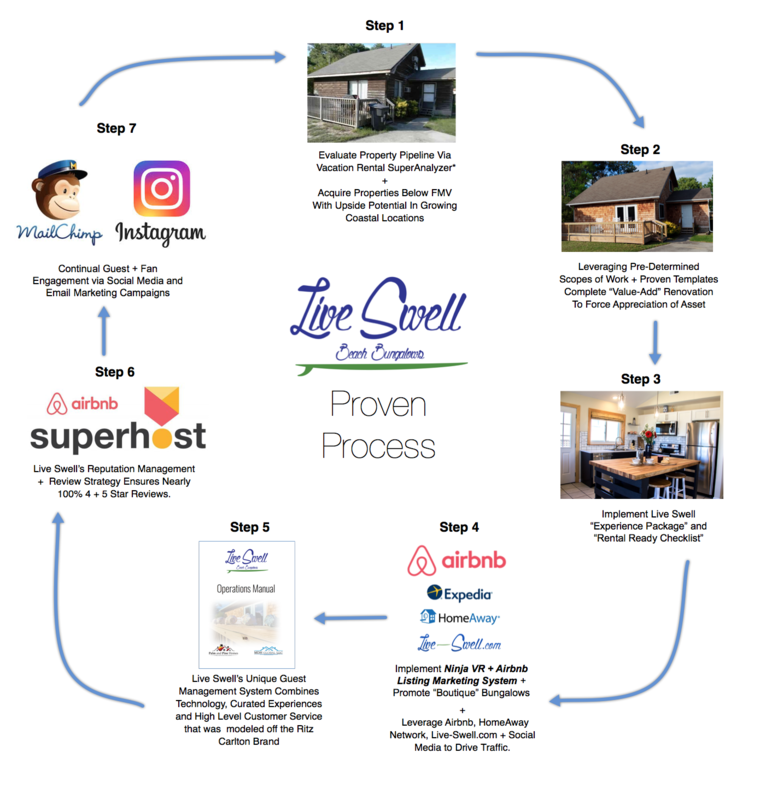 At Live Swell we are not single unit vacation rental owners, we own multiple units, have build a boutique brand of vacation rentals and have operated in two of the most competitive markets in the US. Our properties are top ranked and top performing in our area. Practical vacation rental investment and conservative real estate investing is what we believe in and what we preach. The majority of our vacation rental business model is discussed in Vacation Rental Confidential, for this post we will focus on the principles of how to get a vacation house for free! The problem most folks have that want to buy a vacation home is that they simply don’t know how to do it wisely, they are not trained in real estate investment. Nor is their realtor. Complicating the scenario more is the fact that most of these new vacation home buyers are driven by emotion, which means intelligence may go down! The truth is lack of knowledge and uncertainty holds people back from participating in extraordinary things, like buying a vacation home. It is OK to be fearful but its not okay to let fear hold you back from achieving your dreams. So here is the good news, a person can become more confident the their quest to buy a “vacation home for free” when the are proficient at the process of buying real estate assets wisely. Notice I mentioned “proficient,” not “aware” or not “ignorant.” Many times people confuse being “aware” with being “proficient.” In real estate purchases this is particularly true as people may have a false sense of security because they have lived in a home or fixed up a home previously. This is a dangerous trap to fall into. 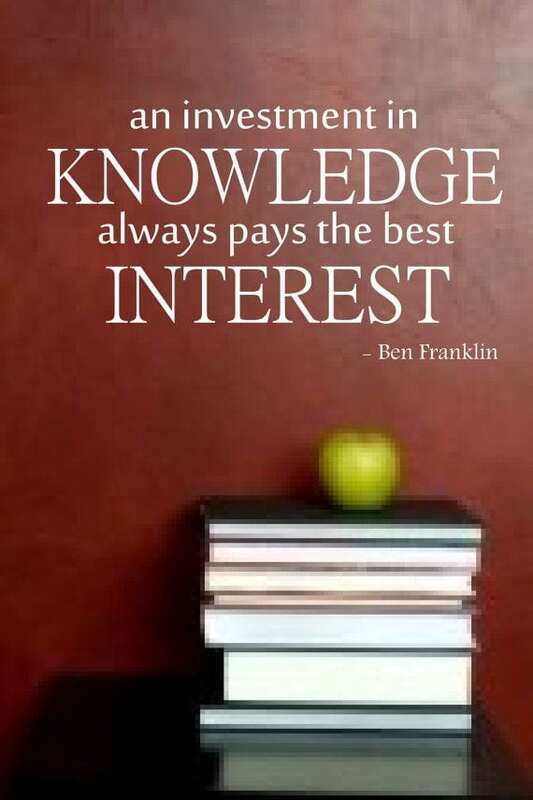 Think about it, doctors and attorneys invest hundreds of thousands of dollars on their education and invest another 6 to 8 years of time before they can make $1 USD as a professional. In the real estate investing business a person has the potential to make significantly more than a doctor or attorney, but who do you think are doing the profitable deals (Aka Vacation House for Free)? The professionals or the amateurs? Created by Andy Tanner. Click Image for a short but more detailed video explanation by Andy Tanner. Real estate purchases, specifically, primary residences and second homes are the largest purchases an average consumer makes in their lifetime. The sad part is the majority of buyers have little to no real estate education regarding this purchase, so when their vacation home for free turns out to be “passive expenses” they have no one to blame but themselves! The biggest problem with buying a vacation house for free is lack of education: start by educating your self on real estate investing principles. You’ll be glad you did and put yourself in position to get closer to your dream. The real estate business is not an easy business, its a simple business when you are educated and understand the various elements of what it takes to produce an income producing asset: like a vacation house for free. It won’t be easy but it will be worth it. Have you ever watched the shows “Shark Tank” or “The Profit?” If you haven’t, budding entrepreneurs and business owners pitch their idea or product for private investment capital from successful investors like Mark Cuban and Barbara Corchoran. It’s always funny when the contestants are pressed with questions about “knowing the numbers of their business,” a common response from the “sharks” is “if you don’t know your numbers you don’t know your business,” we believe this is true. Property taxes, property insurance, hazard insurance, liability insurance, home furnishings, home decor, amenities, property management, turn over cleaning, inventory, cleaning supplies, repairs maintenance, replacement items, welcome gifts, occupancy taxes, automation technologies etc. We wrote an article on Vacation Rental Expenses that may be worth taking a look at. 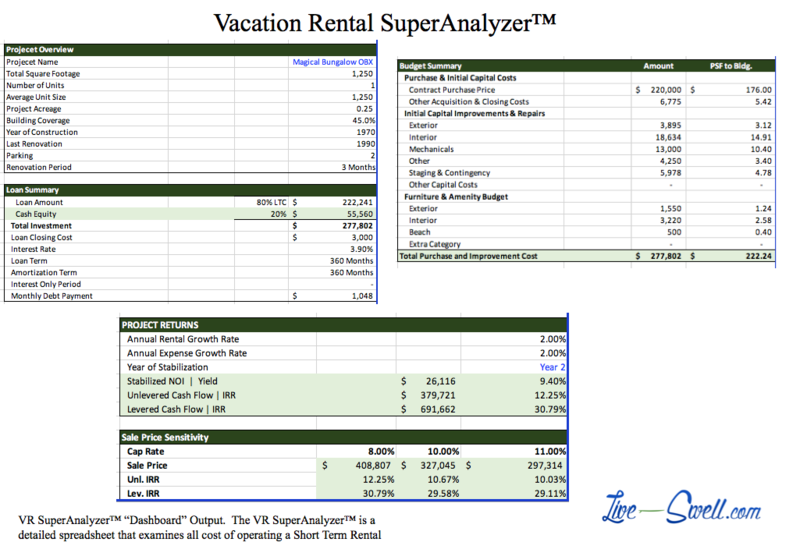 To help us make wise investment decision we leverage our Vacation Rental SuperAnalyzer, a tool we created for our own internal vacation rental home evaluations. It allows us to have a consistent and streamlined process in evaluating opportunities that contains all the expenses a vacation rental owner may incur. This tool helps us to make quick confident decisions to determine if we have a profitable vacation rental opportunity and keeps us safe. It can help us determine what the acquisition price it would take to be profitable. With this process we are not guessing nor will be surprised by unforeseen expenses. Know your numbers! or your vacation house for free will not be, it will cost you money. Pro Tip: If you want to make sure you stay out of hot water, make sure you plan for the worst case scenario. For example, what if there is a natural disaster in your vacation home location and it can’t be rented for some time? What if you have some unforeseen problem to take care of? Proper preparation usually mean this difference between scraping your knee and cutting your leg off. In real estate mistakes cost significant money and more importantly absorb valuable time to recover. At the end of the day if you truly want a “vacation house for free” all the revenues must cover the expenses, other wise the property will “cash flow” negative – and thats not “free.” Just to be clear, that may not mean that money is “lost” over the lifetime of the vacation rental investment, because when done wisely, other potential monetary benefits include, mortgage interest deduction, depreciation of the asset and appreciation gains. Some folks, like most on TV shows, simply want their vacation rental for free to “just covering the mortgage,” and that is fine, it is important to understand you goals going in to this. In this scenario, however, the rental income required to cover “just the mortgage expense” is much less than what will be required to run a profitable (cash flow positive) vacation rental business profitably. It simply depends on what you are looking to achieve and how emotional a person get in the vacation rental buying process. Investing and business involves risk, it is an unavoidable fact. Professionals manage risk and amateurs don’t manage risk as much. These are the horror vacation rental investment stories you hear about: “the friend” or “co-worker” that invested in real estate and took a hair cut. There are ways to reduce your risk when looking for a vacation house for free. In the previous section we discussed two ways to do this; education and analyzing the opportunity’s financials (also known as deal evaluation), the math. We will now introduce a few more key factors and how you can use them to your advantage. Every successful Real Estate Investor knows you make your money when you buy, you realize your money once you sell. You can never change your acquisition price point! Remember the folks that got caught in the 2000’s housing bubble? They had to wait years to regain the property value losses and some are still “underwater,” Yikes! One of the best ways to reduce your risk is to “buy right,” so it is important to learn how to buy real estate a discount from fair market value. The MLS, Multiple Listing Service, is typically a highly competitive marketplace and a less likely place to find good discounted real estate but there can be good opportunities to ID a potential vacation house for free. On the MLS, have your realtor take a look at the “stale,” “expired,” or “short-sale” listings or if your open to a renovation project the ones that mention “TLC” or “fixer-up.” These options are more likely to be discounted. The kind “retail” buyers don’t desire or can’t figure out how to put together. Professionals that find deeply discounted opportunities have referrals networks, go to public auctions and implement direct marketing to acquire properties directly from sellers. Strategies like this reduce transaction costs put a person in position identify and acquire vacation homes at deep discounts. Most buyers are ONLY shopping in the retail market, The MLS. We aim shop off-market where there are less buyers, when there are less buyers (aka demand) prices go down! The fact that you are considering buying a vacation home in the location of your choice likely means that others will have similar interests, so that is a good thing. Be careful, however, of the lesser known neighborhoods or extreme remote locations. If a location is not easy to get to or nobody wants to go you’ll never have the demand of renters to cover the expense you want to. There are analytics tools today like AirDna and others that can help with some general data, you can find that on our Vacation Rental Resources page. Our main location we invest in is the Outer Banks of North Carolina, its a popular summer beach location for Northeast and Mid-Atlantic residents and is within an 8 hour drive from the majority of the US population. How effective your vacation rental property is marketed can also hep to reduce risk and provide a higher likelihood of profitability. Properties with more marketing appeal, i.e. 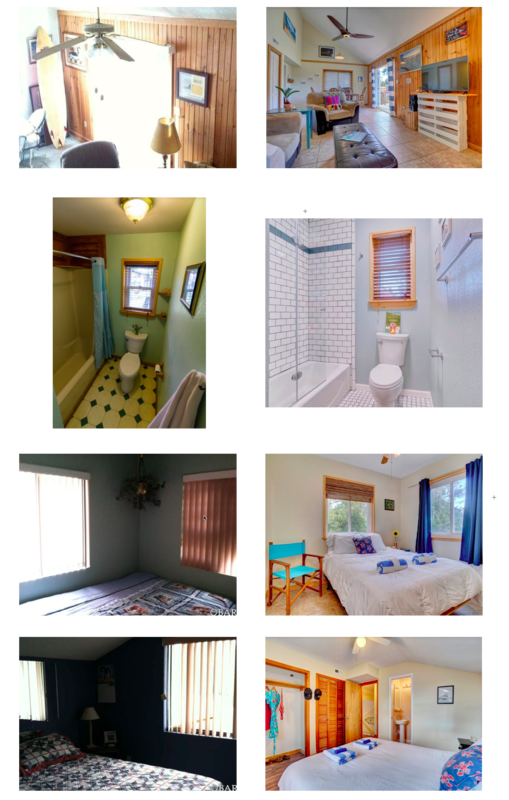 professional renovated, professionally staged, professionally photographed and armed with professionally listing copy, are keys to getting more bookings and getting paid premium rates! More bookings means more revenue in terms of higher highly rates and increases off-season occupancy. More overall revenue reduces the risk of any business, it means a person can cover all expenses and just as important reinvest back into their rentals and brand. 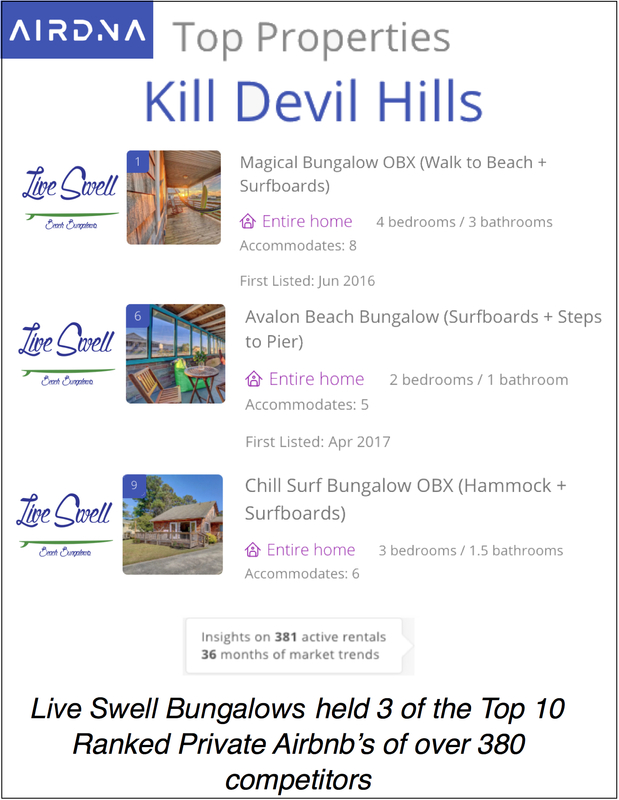 If you desire top performing vacation properties and want a shot at being a top ranked property in your marketplace check out the Ninja VR + AirBnb Marketing System,Step #4 in the Live Swell Proven Process, we’ve done it over and over in some of the most established and competitive vacation rental marketplaces in a short time! Success leaves clues! It is important to realize that if you don’t budget your usage of the property, block the calendar, you may not be able to use it when you want to. 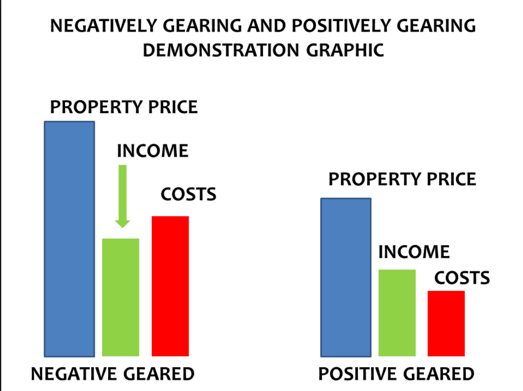 As far as problems go, this is a good problem to have, it means your property is renting. By design, our vacation homes in the Outer Banks work perfectly for the vacation home for free model. In the summer high season Maria and I don’t want to be in the Outer Banks, we don’t love the humidity, the crowds and the surf is typically worst this time of year. So we spend our time on the west coast, typically in San Diego, California or Baja Mexico. Many of you reading feel bad for us, we know its a terrible lifestyle! During our summer high season, rates are strong so we are able to maximize the income potential. In this way we can preserve the most pleasant times of year to visit, like the spring and fall. The cool thing about real estate investments, unlike most assets, is that financing is readily available for it. But a person does need to learn how to buy real estate! What are the financing options available to a person without financial and real estate investment education? If you guessed “the bank” thats what over 99% of people respond. Only one source of financing is limiting, which means people in this scenario have limited options and opportunity. What are the financing options available to a person with a financial and real estate investment education? Well, you may not know, yet. There are many ways to acquire real estate assets with out the “bank.” Recall earlier we mentioned “Shark Tank” and “The Profit.” Approached as we are describing in this post, the vacation rental purchase, is a business opportunity . When business opportunities are attractive to investors, a person may be able to raise the money for it from a private investor. There are also creative real estate financing strategies like, “subject-to,” “owner financing,” “lease purchase options” and others available to all of us. All of these advanced strategies do require a level of proficiency, if a person is not confident explaining these there is no hope. Whats the cost of missed opportunities to a person with a limited financial and real estate education? You DO need money to acquire vacation homes but the money does not have to be all yours. A bank can help with “second home loan” or an “investment property loan.” The applicant will be required to put some money “down” to satisfy the loan requirements. In the traditional “investment property” loan scenario the requirement is in the range of 20%-25% down. Now that may be too much to bite off if we haven’t saved up a bunch of money as a $500,000 purchase price would require $100k plus closing costs to get this example going. But if you learn and are open to “creative financing” the world of real estate really opens up. You may consider getting a credit partner or partners to spilt the investment and reduce individual costs, but that does come with sacrifices. Depending on lending standards you may be able to qualify for a “second home loan,” these are treated more like primary home loans and you may be able to get in with less money down like in the 10% range. In the same example a $500,000 property would only require $50,000 plus closing costs to get started, which is a bit more palatable. For those, that don’t have great credit the bank won’t be an ideal option. Seeking out the creative financing strategies will be options, but we must be confident in presenting them. We recommend you to start the loan qualification part before beach front bargain hunting because if your financing is not in place you won’t be able to get a vacation house for free. You may feel uncomfortable buying your first vacation home, thats OK, a person usually feels more confident the more resourceful they are and the more educated they are. So be smart and know your limits. If its a $100,000 renovation is required for your first project maybe reconsider, start with a project you are confident you can handle. 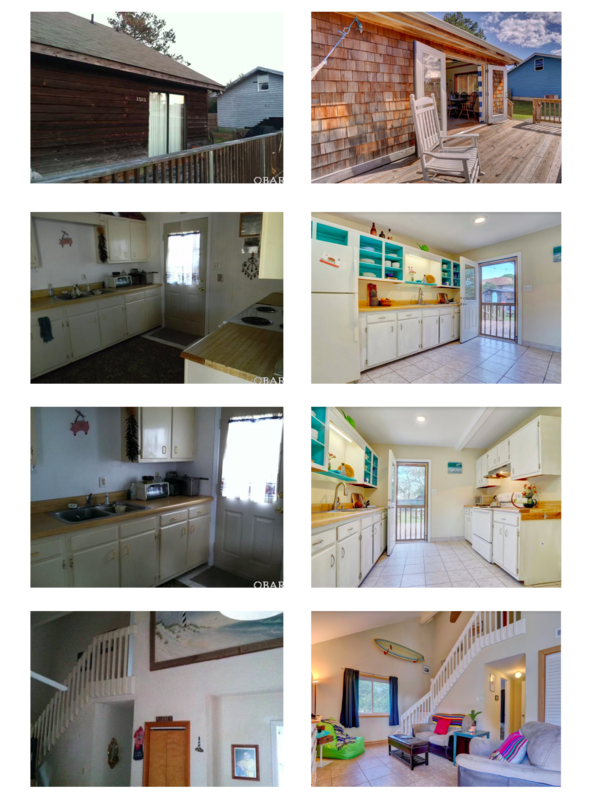 For example, the Chill Beach and Surf Bungalow OBX was a real dump when we picked it up, but it was on the market a long time, a “stale listing,” that clearly most retail buyers had little interest in. When demand goes down so does price, but we were prepared and educated to take on a project of this size. 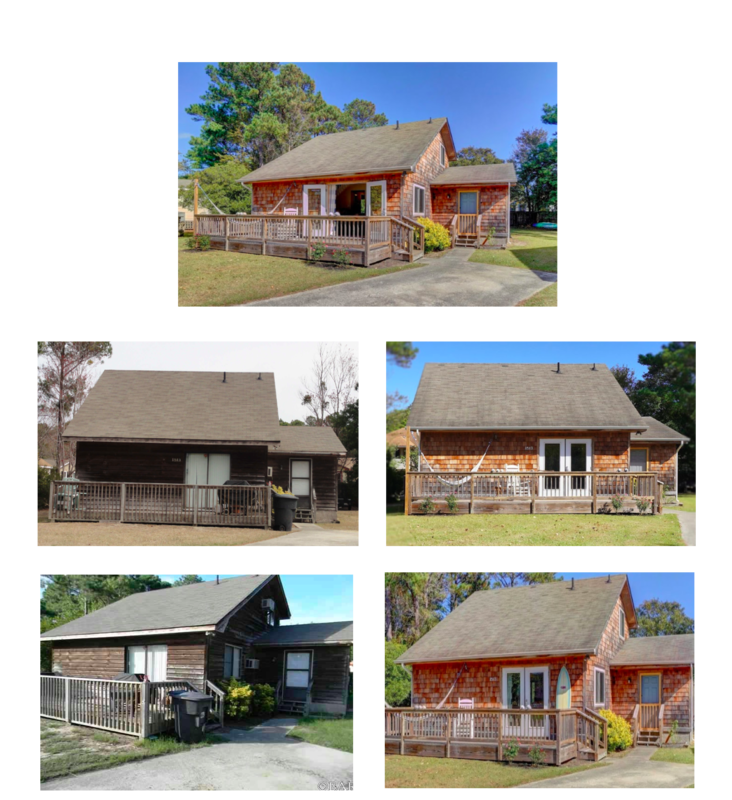 Here are some before and after photos of the project, if you think the exterior is funky, you may have fainted inside the bungalow. So can you really make this dream of a Vacation House for Free a reality? The answer depends on how well you buy and run your vacation rental business. For those that are educated and prepared and do it right the answer is absolutely YES! If you like this article please share it with someone who may like it!